Doesn’t it look superb?! 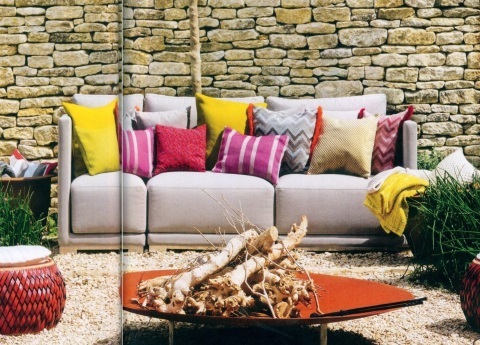 Kate and Ali styled the shot using brightly coloured textured cushions, and placed the sofa in front of a terracotta fire pit, surrounding it with red textured stools. Stunning! One of our best selling brands, Belgian company Manutti specialise in exceptional contemporary outdoor furniture that looks like great quality indoor furniture. Fully covered in Nautic fabric, with special quick dry outdoor foam the Flow range has been a runaway success, but Manutti make several other fully upholstered outdoor sofa/chair collections too. And our Japan planters got a look in on their Lifestyle news page. 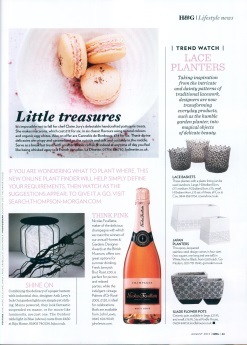 Trend Watch with ‘Lace Planters’: ‘designers are now transforming ever day products such as the humble garden planter into magical objects of delicate beauty’. Well, we couldn’t agree more! Previous PostPrevious Bonaldo Big Table strikes again!